What is Lamisil? What is Lotrimin? Lamisil is a Brand name for an antifungal medication that contains terbinafine as an active ingredient. This medicine fights infections that are caused by fungus. Lamisil is used for the treatment of fungus infections that affect the toenails or fingernails. Lamisil oral granules are used for the treatment of fungal infections of scalp in children who are older than 4 years. 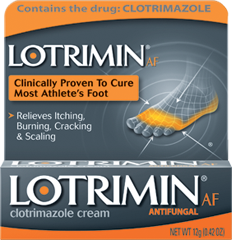 Lotrimin is a Brand name for an antifungal medication that contains clotrimazole as an active ingredient. This medicine fights infections that are caused by fungus. Lotrimin is used for the treatment of fungus infections that affects jock itch, athlete’s foot and ringworm. Lotrimin binds to the fungal cell membrane and weakens it, which allows content of cell to leak out and results in fungi death. Are Lamisil and Lotrimin same thing? Lamisil and Lotrimin are both antifungal medicines. They both have similarities but they are not the same thing. The active substance of Lamisil is terbinafine and active substance of Lotrimin is clotrimazole, and both drugs have different mechanism of action, through the inhibition of different enzymes. Lasmisil is more effective against dermatophytes infections of the skin, hair, and nails and has less potent action on the yeasts comparing to Lotrimin. Also, Lamisil requires less time to cure the disease. Lotrimin is effective against both types of fungi, and it is strong enough to cure slowly-healing and persistent infections. Lotrimin is also available in the form of vaginal cream while Lamisil is not. Lotrimin advantage is that it is very effective against Candida albicans infections. Lamisil specific feature is that clotrimazole, during treatment, can accumulate in the skin and keeps on working for some time after the therapy is stopped. 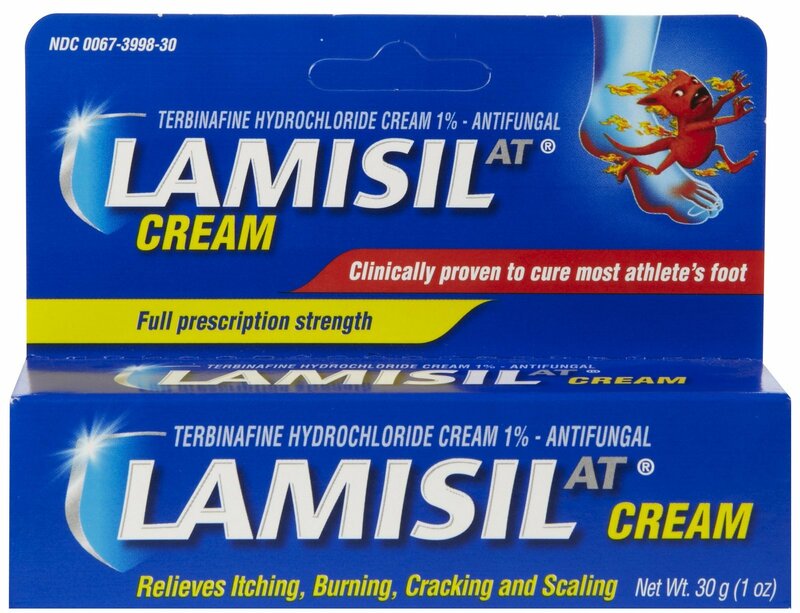 How does Lamisil and Lotrimin treat jock itch ringworm,nail fungus, athlet’s foot, yeast infection or diaper rash? Lamisil active substance in terbinafine. It contains allylamine structure and works by inhibiting ergosterol synthesis, one of the major components of fungi cell membrane, by inhibiting the fungal enzyme squalene monooxygenase. This inhibition leads to the squalene accumulation a substrate catalyzed by squalene monooxygenase to 2,3-oxydo squalene. Decreased amounts of ergosterol and high concentration of squalene are thought to contribute to terbinafine’s antifungal activity. Lotrimin active substance is clotrimazole. This imidazole derivative works by inhibiting the biosynthesis of ergosterol, one of the major components of fungi cell membrane, by inhibiting cytochrome P-450 enzyme called 14-α demethylase. Clotrimazole increases membrane permeability and disruption of enzyme systems which are bounded to the fungi cell membrane. Clotrimazole may also interact with membrane phospholipids, impair triglyceride and phospholipid biosynthesis, inhibit endogenous respiration, inhibit the uptake of purine and transformation of yeasts to mycelial forms, and inhibit the transfer of potassium and calcium ions by blocking the ion transport pathway known as the Gardos channel. Onychomycosis, toenail or fingernail dermatophyte infections caused by most strains of Trichophyton rubrum and T. mentagrophytes. It is also active against Epidermophyton floccosum, Candida albicans, and Scopulariopsis brevicaulis species. Tinea Capitis, scalp ringworm infections caused by susceptible dermatophytes such as Trichophyton, Microsporum species. This indication requires treatment with an oral antifungal. Tinea Corporis (body ringworm) or Tinea Cruris (jock itch). Tinea versicolor caused by Malassezia furfur infection. Tinea pedis, Tinea cruris, and Tinea corporis caused by Epidermophyton floccosum, Trichophyton rubrum, Trichophyton mentagrophytes and Microsporum canis infections. Lamisil is available in following forms and doses: 200mg tablet, 125mg oral granules, Lamisil AT cream 10mg/1g, Lamisil AT Continuous spray liquid 1.25ml/125ml, Lamisil AT Gel 10mg/1g, Lamisil AT for Women Cream 10mg/1g, Lamisil AT Jock Itch Cream 10mg/1g and Lamisil AT Spray 1ml/100ml. Lotrimin is available in the form of cream 10mg/g, vaginal cream 1g/100g and 2g/100g and 1% lotion. Lotrimin is also available in the form of topical powder, topical powder spray and topical solution spray, which contain the active ingredient miconazole. Can you buy Lamisil and Lotrimin over the counter? Yes, both products are available over the counter. Who should not take Lamisil and Lotrimin? Lamisil can in some very rare cases cause severe liver damage. It is not known whether terbinafine actually caused this problem. In most cases, the patient already had a serious medical condition before taking Lamisil. Patients who have liver disease, history of depression, some autoimmune disorder such as lupus or psoriasis or weak immune system should talk with their doctors first before using Lamisil or Lotrimin. Patients allergic to any of active ingredients or components of Lamisil or Lotrimin should avoid these products. Lamisil and Lotrimin topical forms FDA pregnancy category is B. These drugs are not expected to be harmful to an unborn baby, but women should wait after their pregnancy to start treating their nail or scalp with these products. Patients should tell their doctor if they are pregnant or plan to become pregnant during treatment. Terbinafine can pass into breast milk and may harm a nursing baby. Patients should not breast-feed while using Lamisil. There are no data of clotrimazole excretion into human milk. Woman breast-feeding a child should talk their doctors first before using Lotrimin products. Use the medicines for the full treatment time even though the symptoms may have improved. Patients should notify the physician if there are no improvements after 4 weeks of therapy. Inform the physician if the area of application shows signs of increased irritation such as: itching, burning, redness, blistering, swelling. How should Lamisil and Lotrimin be used? Lamisil tablet should be taken with a full glass of water. Lamisil granules should be sprinkled into a spoonful of pudding or mashed potatoes. Mixture should be swallowed right away without chewing. Do not save the mixture for later use. The granule mixture should be taken during meal. Lamisil tablets 250mg should be used once a day for 6 weeks for the treatment of fingernail onychomicosis infection. For toenail infection it should be used once a day for 12 weeks. Lamisil oral granules should be used once a day for 6 weeks for Tinea capitis treatment. Lotrimin and Lamisil cream and Lamisil spray should be gently massaged into the affected and surrounding skin areas twice a day, in the morning and evening during 1-2 week or as directed by the doctor. Lamisil gel for the treatment of athlete foot should be used once a day at a bedtime for one week of treatment. Clinical improvement after Lotrimin usage, with relief of pruritus, usually occurs within the first week of treatment. If the patient failed to show improvement after 4 weeks therapy with Lotrimin, the diagnosis should be reviewed. Patients should take these medications for the full prescribed length of time. Symptoms may improve before the infection is completely cleared. Skipping doses may also increase the risk of further infection that is resistant to antibiotics. While using these medicines, some patient may need frequent blood tests. It may take several months for nails to return to their normal appearance after Lamisil treatment. What should I avoid while using Lamisil and Lotrimin topical? Patients should avoid getting these medicines in their eyes, nose, or mouth. Patients should avoid using other skin medications on the areas they treat with Lamisil or Lotrimin topical unless their doctor tells them otherwise. Patients should avoid wearing tight-fitting, synthetic clothing that doesn’t allow air circulation. They should wear clothing made of loose cotton and other natural fibers until the infection is healed. What if I overdose Lamisil and Lotrimin? Patients should seek emergency medical attention or call the Poison Help line at 1-800-222-1222 if they overdose Lamisil or Lotrimin. Patients using Lamisil should call their doctor immediately if they exhibit symptoms of liver damage, such as nausea, loss of appetite, itching, upper stomach pain, dark urine, clay-colored stools, or yellowing of the skin or eyes. These events can also occur whether or not patients have ever had liver problems before. What if I missed the dose of Lamisil and Lotrimin? Patients should take the missed dose as soon as they remember. They should skip the missed dose if it is almost time for next scheduled dose. They should not take extra dose to make up the missed dose. Can I drink alcohol while taking Lamisil and Lotrimin? Patients have to avoid drinking alcohol while they are on Lamisil or Lotrimin therapy or any other antifungal drug. Alcohol is absorbed into bloodstream and also excreted through the liver, the same as many antifungal drugs. So, when liver is working really hard to filter out terbinafine or absorbed clotrimazole, adding alcohol can cause too much stress on the liver. The worst side effect that can occur very quickly as a result of antifungal-alcohol interaction is complete liver failure. The early sings of liver failure are nausea, vomiting, loss of appetite, and jaundice. When complete liver failure occurs, the only treatment is a liver transplant, which is a lifetime of medications, hospital visits, and having days of feeling well and unwell. Using tobacco with Lamisil or Lotrimin may also cause interactions to occur. The following interactions have been selected on the basis of their potential significance and are not necessarily all-inclusive. Patients should avoid caffeine (coffee, soda, chocolate) while they are on terbinafine therapy. Terbinafine may cause caffeine to stay in the body longer than usual. What are the alternatives for Lamisil and Lotrimin? Alternatives for Lamisil on the market that contain trbinafine as an active ingredient are: Athletes Foot cream, Cvs Pharmacy Athletes Foot, Kaiser Permanente Terbinafine Hydrochloride, Shoprite Equate Athletes Foot and many other. Alternatives for Lotrimin on the market are: Alevazol, Aspiera Anti-fungal, Athlete S Foot Afac, Canesten 1% Topical Cream, Canesten Cream 3, Clotrimaderm External Cream, Dermatin Antifungal, Femmesil, Gehwol Fusskraft Nail and Skin Protection nad many other.